Tom - who is now going by the name of Captain Mudd, continues his search for Marya. He has help, with the airship The Stone Cloud and it's motley crew. Since the events of the previous book, the crew of The Stone Cloud have become adept and moderately successful pirates, using guile and intelligence to overcome more powerful airships. His success as a Pirate hasn't helped him get any closer to finding Marya, although he has found out that she was sold to a wealthy man via a wife-monger. First he must find a way back into the tower, which is easier said than done when all ports appear to be heavily guarded and most not at all friendly to a pirate ship. To do so they may need to enlist the help of the fabled, reclusive character "The Sphinx", who in part acts as a caretaker of the tower. 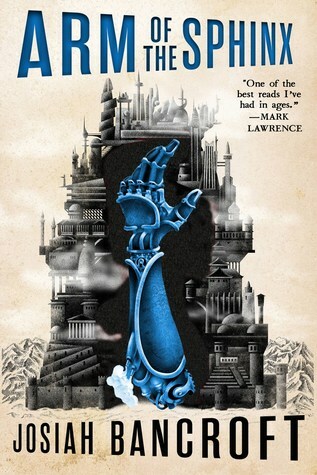 The first book in the Books of Babel series was something of a surprise, the debut of the author it is both compelling and original, completely different to any fantasy book around at the moment. Self-published a number of years ago, both Senlin Ascends and Arm of the Sphinx were picked up by Orbit / Tor last year. The third in the series - The Hod King, is out this month. For those who haven't read the first book there are brief reminders of what's gone before, and it's different enough to stand up on it's own. One of the things you first notice about Arm of the Sphinx is how it's both different and yet similar to the first book. Instead of a surreal journey through the tower, this book begins on-board the airship and it's quite some time before we find the story on firmer ground. The same fluid style of prose is there though and we still get treated to these wonderfully rich descriptions of the towers many strange places and stranger people. The atmosphere is different, It feels like an "Empire Strikes Back" moment - much less optimistic and more darkly brooding. The characters we were briefly introduced to in the last book are given time and space to grow here - Adam, Voleta, Iren and first mate Edith. As you might expect from the title, Edith (who has been given a new mechanical arm) gets the most time and focus. I loved the interplay between them and seeing how these relationships grow. Here marks another big difference, in the previous book it was pretty much all about Senlin, from Senlin's POV. This time while a large part of the book is still about the ex-school headmaster, it also moves from one characters POV to another. This provides fresh insight and helps to define Arm of the Sphinx as unique, a sequel as it should be and not just a continuation of the previous book. The story is engaging with a plot that keeps the reader on their toes, it becomes clear that the series is more than a simple search for Senlin's wife - there is a lot going on and Senlin continues with his canny ability to make powerful enemies and yet remain in one piece. Arm of the Sphinx is the perfect sequel, it improves on everything that made the first book so good and at the same time offers a real, solid difference while still continuing the adventure of the quiet school headmaster, exceptional. Written on 14th January 2019 by Ant.